These ornaments are sure to be an instant hit when hanging from your tree or gift this year! 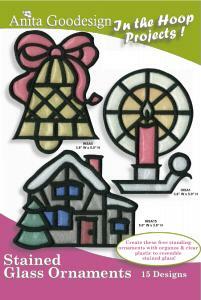 These freestanding ornaments resemble stained glass because they are created with organza and clear plastic. Light will show through them just like stained glass. Best of all they are embroidered completely in the hoop!